I used these in Civil Defence in the mid '60s. The detector is an ionisation chamber. By removal of a screw plug in the end below the meter, the instrument would detect an alpha radiation sorce placed in the hole. I believe this was for test purposes. The same case was used for the later MD.3 which was used in the forces until at least 2003! I bought one off eBay, where it was incorrectly described as a "Geger Counter". This has solid state electronics and ranges of 0-3, 0-30 & 0-300 centiGrays/hour. Interestingly the battery positions are still labelled LAMP & FIL (the latter refers to the filament of the original valve type of instrument. The unit no longer uses an HT battery, but 2 D cells. According to the test certification I got with my MD. 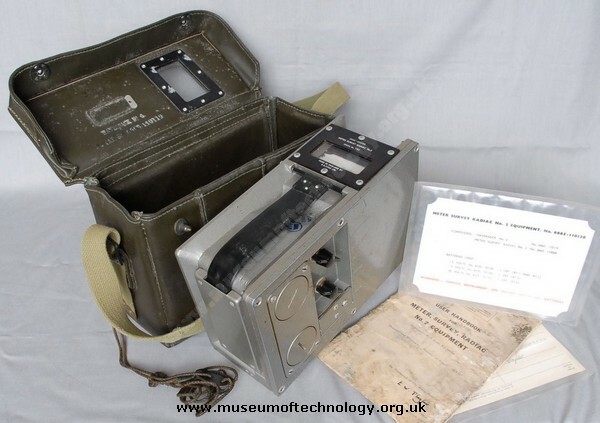 3 it was tested at the Institute of Naval Medicine, Gosport and then used at RAF Akrotiri.